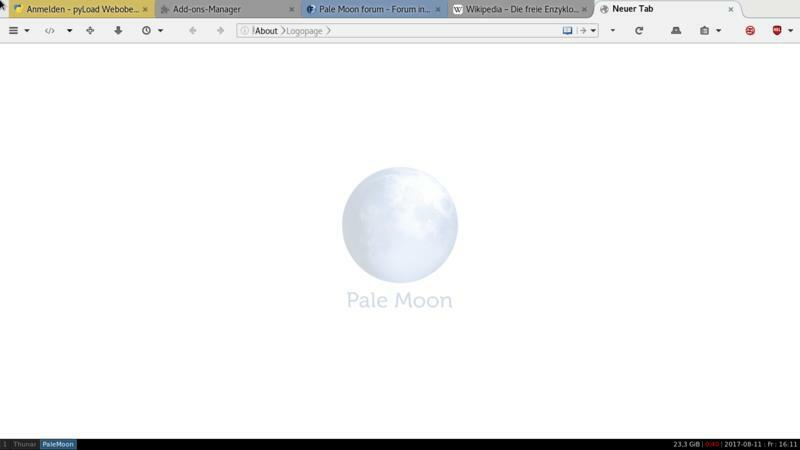 Switched to Pale Moon because of Firefox's planned removal of support for XUL extensions and user interface customization. Plenty of userchrome.css tweaks here. Ask and ye shall receive. Oh that is very nice. Superb in fact. is there any chance letting us know what theme you are using, what add ons and why and how to configure ours like yours? That would be greatly appreciated. 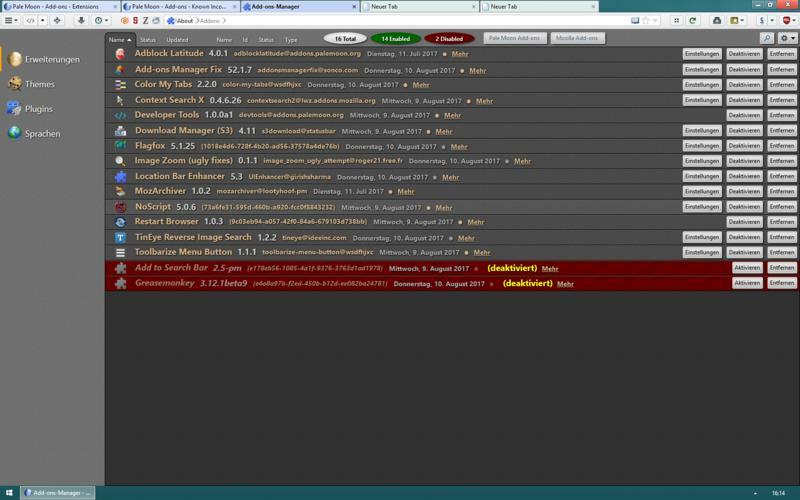 Thehandyman1957 wrote: So I did some clean up and changes to my browser including getting a auto hiding sidebar for my tabs and I thought I would share. I organized all my speed dials into groups and made the thumbnails bigger. I also ditched the status bar for a cleaner look. Let us know what you did mate. So my colors and look is a little bit different but pretty close. Here is the new look. So here are some of the add-on's I'm using to get this look. To get this look you first have to load Dark Moon with persona switcher already installed. Then after reboot, use persona switcher to load the persona of your choice. If you choose to download more persona's you have to do those two steps over again. To get rid of the title bar and tighten up the top I use two add on's. The first is obvious, to get rid of the title bar. The second is what you see on the right hand side. It normally is hidden but I did a screen shot of it exposed so you could see it. To get the Noia look I like. I realized after I took the screen shot that I had not removed the dividers from that add on. Gone now and much cleaner. ColorfulTabs 31.1.9 to color my tabs so I can distinguish them better. Sadly this was the only color tab add on that would work with Tree style tabs in Pale Moon 27. But the default colors were all pastels. But it does let you change the default colors. Honestly, I like this better than before. The top is tighter, and now that I got all the settings on Tree Style Tabs right, it fits nicely. If your needing actual settings for these just PM me. I switch back on skin color to spice things up. This is what linux Pale Moon looks like running in linux Mint 18.2 (Sonya) Xfce desktop environment. 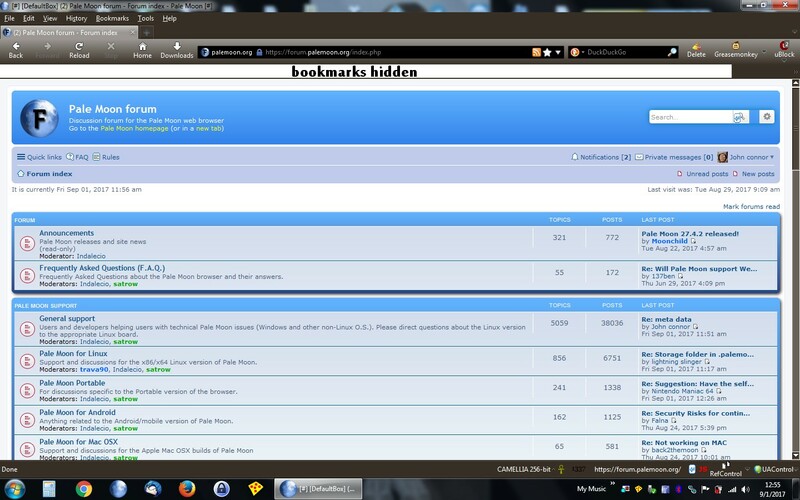 The skin color (lightweight theme/persona) is Caramel and I've changed the folder color in my Bookmarks Toolbar to Aqua. The aqua folder color makes for a good match for the blue color of the Title Bar. You'll have to left click on the attachment to get the larger 1366 x 768 pixel size. Very pleasant on the eyes. Thehandyman1957 wrote: Very pleasant on the eyes. My eyes like lighter colors rather than darker colors. And it is color coordinated with the Status Bar too. 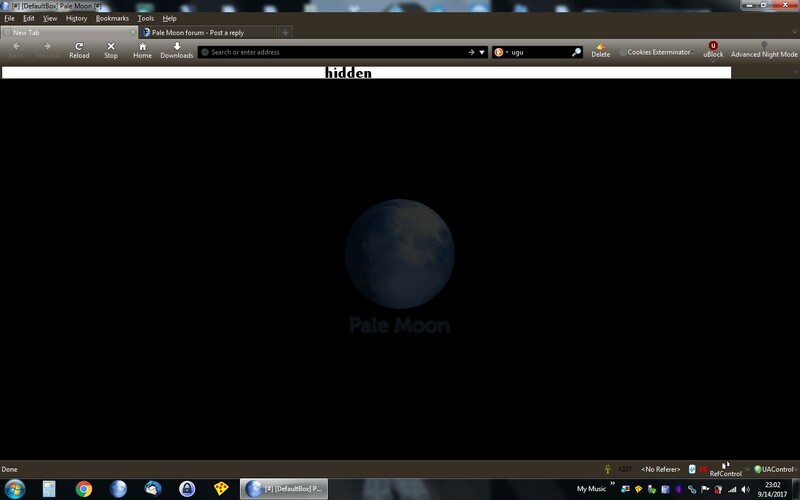 One of my friends on the Standup Zone site liked how my linux Pale Moon browser looked with the "Caramel" lightweight theme/persona solid color skin. I told him I had a new "Plain Beige" lightweight/persona solid color theme for my Pale Moon. I color coordinated the Plain Beige skin and matched it with my new linux Mint 18.2 theme which is "Xfce-flat" and it is a dark color. Basically; the Menu Bar, Bookmarks Toolbar and Status Bar have the "Plain Beige" solid color ski while the "Xfce-flat" black color works with the Pale Moon Title Bar as well as my Mint black colored Panel Bar. Anyway, since my 27" monitor has a 1920x1080 resolution, I resized the attachment to 1366x768. You'll have to left click on the attachment to make it larger. Well, since I was gone for a little while, my wife got on my desktop linux hard drive and she didn't like my "Plain Beige" lightweight/persona theme. Said it was too bland. I told her if she didn't like it, pick one that we can both live with. She said to me, "No problem". So she picked the lightweight/persona theme named, "Dream of Waves". You'll have to left click on the attachment to make it larger and it will enlarge to 1366 x 768 pixel size. I liked your other one better! Thehandyman1957 wrote: I liked your other one better! There are a few truisms in a marriage. One of them is when a wife says; "What is mine is mine, but what is yours...........is also mine". I fixed that by giving mine, her own computer. Of course there is the separate log in thing. I wish I was privileged enough to have a wife. I'm going on 37 next month and I ain't getting any younger. Although I've had a medical set back in my life that's preventing me from seeking a nice mate. Plus, I'm picky as hell. 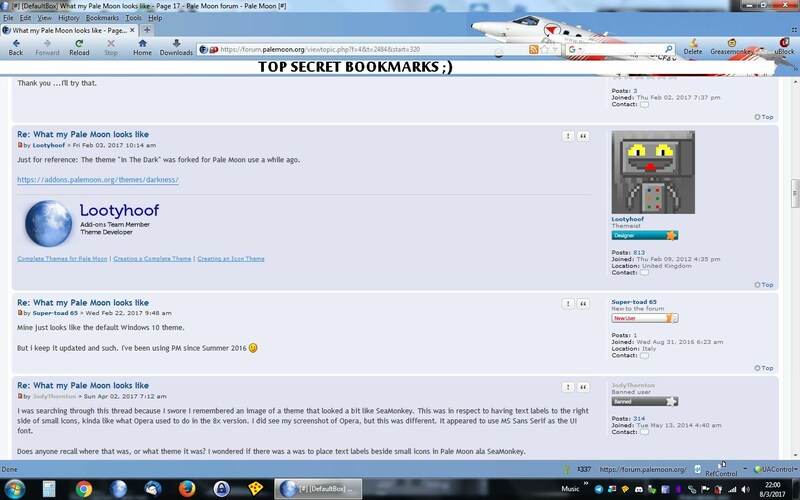 I was the Seabreeze forum looking for information on some downwind and longboard sups. I happened to come across a short YouTube video show casing the new carbon Naish 2018 Maliko. I really liked the orange and yellow color of it. The video of the carbon Maliko is below. Since I really liked the color of the new Maliko, I thought I could find an orange yellow mix skin color for my Pale Moon. Anyhow, I found it. The lightweight theme/persona is named fittingly, "Orange Yellow Mix". Below is an attachment showing my new Pale Moon skin color. Of course, you'll have to left click on the attachment to enlarge the attachment to 1366 pixels.